"Floral Goddess II" Original Hand-Made Ceramic Mask Sculpture by George Marlowe, with Certificate of Authenticity! $1,500.00 $750.00 Only 1 Left! 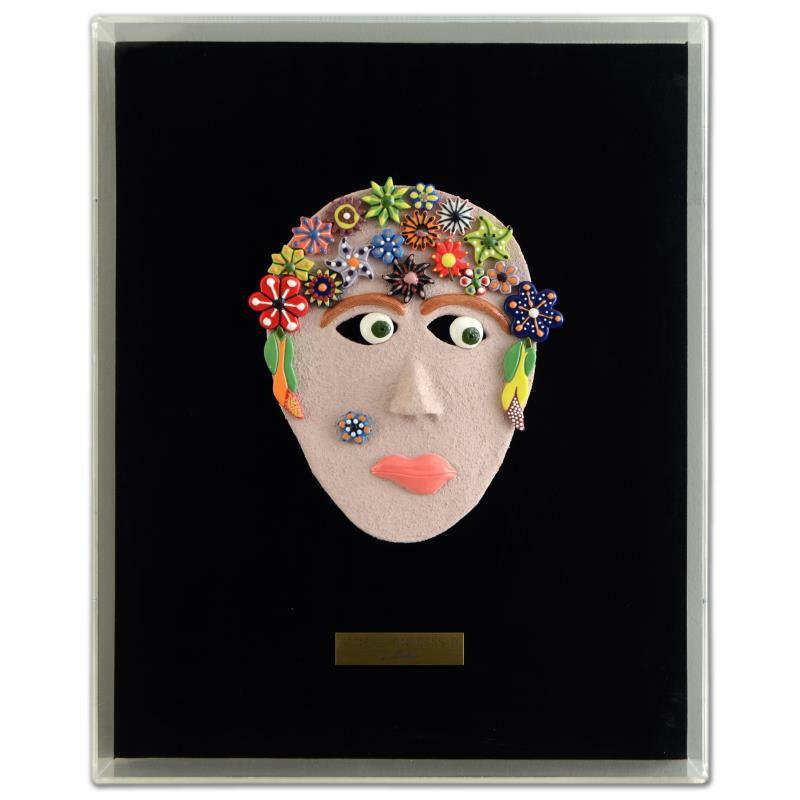 "Floral Goddess II" is an original hand-made ceramic mask sculpture by George Marlowe! This piece comes suspended and encased in a custom-made Lucite display with signed metallic name plate. Includes Certificate of Authenticity. The box frame measures approx. 18.5" (width) x 23" (height), 4.5" (depth); 12lb (total weight). The mask measures approx. 9" (width) x 10" (height). From a family of artists, George Marlowe naturally fell in love with art as a child. George started off as a self-taught painter in the 1960s, and by the 1970s, he was developing art and craft products for Mattel, Ceramichrome and the art and craft division of General Mills. During his employment at Ceramichrome, he got his education in ceramics, developing a line of once fired ceramic craft products for the mass market called, "BisqueKits". For a year, George had the honor of working for some of the finest and most highly regarded ceramists in the world. He says it was an education "that you couldn't pay for." He was reintroduced to ceramics in the '80s when a friend was taking a ceramics class at a local recreation center and the teacher invited George to stay and create some pieces. That morning, George created his first two masques and knew that "masques of clay" were his immediate calling. George Marlowe, "Hearts" Framed Original Acrylic Painting on Canvas, Hand Signed with Certificate of Authenticity. "Every Woman VI" Original Hand-Made Ceramic Mask Sculpture by George Marlowe, with Certificate of Authenticity! "Every Woman III" Original Hand-Made Ceramic Mask Sculpture by George Marlowe, with Certificate of Authenticity! "Floral Goddess I" Original Hand-Made Ceramic Mask Sculpture by George Marlowe, with Certificate of Authenticity! "Poker Joker #3" Original Hand-Made Ceramic Mask Sculpture by George Marlowe, with Certificate of Authenticity! "Coming Together" Original Hand-Made Ceramic Mask Sculpture by George Marlowe, with Certificate of Authenticity!